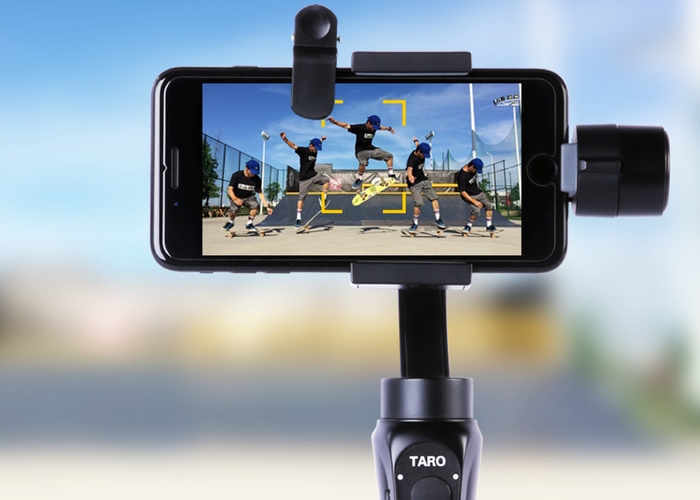 Photographers searching for a portable auto tracking and stabilisation system may be interested in a new piece of hardware created by Taro Tech based in Los Angeles, California. Taro is a new system which has been designed to control your camera whether it be a smartphone or larger DSLR as if it were a cameraman combining infrared technology, artificial intelligence and more say it’s creators. Watch the demonstration video below to learn more about the Taro which is already raised its required pledge goal with still 44 days remaining on its campaign. The development team explain more about the inspiration and technology incorporated into the Taro camera stabilisation system. Auto-tracking is super-useful when filming outdoor sports like skateboarding, parkour, skiing, basketball, or tennis. However, tracking a fast-moving target against a dynamically-shifting background makes it practically impossible for tracking technologies to work properly. Until now, that is. Taro is proud to introduce a breakthrough product that automatically rotates and tracks your target, making it possible to free up your hands and put yourself squarely in the frame to accurately capture all the action – effortlessly! Taro is now available to back via Kickstarter with early bird pledges starting from just $99 and delivery expected to take place during April 2018. For full specifications and more information jump over to the official Kickstarter campaign page via the link below.